J.J. Abrams already has hopes for a third Cloverfield. The Walking Dead will try its best to keep its new villain’s fondness for foul language. Karen Gillan teases her return to Guardians of the Galaxy. 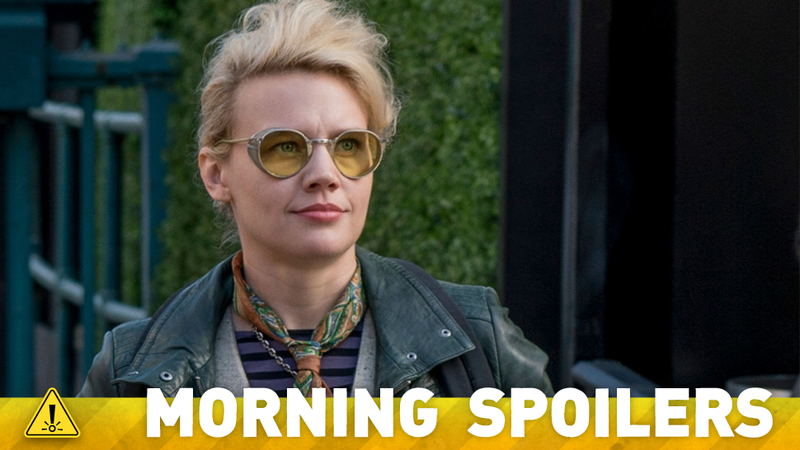 Plus, a new trailer for Penny Dreadful, and Kara gets a strange new look on Supergirl. To me, my Spoilers! Speaking to Entertainment Weekly, Michael K. Williams has confirmed a familiar face appearing in the film: Slimer the Ghost. I’m not going to lie, working with Melissa, and Kristen, and Kate, was really dope. But I got to work with Slimer, dude. Like Slimer!!! I’m in a scene with Slimer! I’m a huge Ghostbusters fan and it was a dream come true. I think that would be presumptuous, because we’re talking about this movie and comparing it to Cloverfield, but I would be lying if I didn’t say there was something else that, if we’re lucky enough to do it, could be really cool that connects some stories. This is just this movie, and it’s only two films that we’re talking about right now. There is something else that we’d like to do, and hopefully we’ll get a shot. Karen Gillan has posted a teasing picture of her return to filming (and to the makeup department, to get ready as Nebula) on Twitter. I would say that there are certain words that try as I might, we are not allowed to say on AMC, and those are certain words that Negan likes to say. So those words are going to be filmed, and people are going to be able to get those words, but there are definitely some broadcast limitations that we’re going to have to deal with. We’re sorting that out now, but I will say that, worst-case scenario, the extras will be extra-special on Blu-ray. I mean, we’re trying to explore some other more interesting options, but that’s the bare minimum of what we’ll be doing. Adam Pally has been cast in the lead role for this Phil Lord and Chris Miller produced time travel drama (previously known as In Time). According to Deadline, Pally will play Dan, a computer science professor seen as “the “failure” of an accomplished family” who invents time travel in an attempt to meet better people. Stephen Amell has revealed that Madison McLaughlin has joined the show in an undisclosed role. After a supernatural event takes the Witnesses by surprise, both Crane and Abbie are forced to work alongside their most hated foes yet. Meanwhile, Jenny and Joe struggle to salvage their relationship, as they continue to battle their own internal demons in the all-new “Incommunicado” episode of SLEEPY HOLLOW. When a therapist is murdered, Lucifer and Chloe enlist the help of Dr. Linda to look into possible suspects. Meanwhile, Malcolm confronts Chloe about the night he was shot, and Lucifer experiences his first bout of jealousy in the all-new “Et Tu, Doctor” episode of LUCIFER. Here’s a new trailer for the show’s third season. Additional reporting by Gordon Jackson and Charlie Jane Anders. Image: Ghostbusters.